THE DRILL BIT: Using a carbide bur to debur or porting and polishing metal work. Using a carbide bur to debur or porting and polishing metal work. Solid Carbide Cylindrical Shape Burs are designed for deburring and speed milling straight edges and plain surfaces on tough metals. These burs come on a 1/4" shank. Our carbide burs are made of only the highest quality micro-grain carbide, giving you the edge when it comes to value. 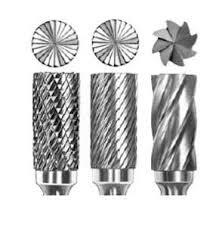 Drill Bit Warehouse has the largest assortment of carbide burrs available. Call us today for all your bur needs, endmills, drill bits for cobalt to carbide drill bit warehouse has you covered.